The War of Korea 6.25 | Kimchi with Eish! I knew Korea had a war. I think I knew it had to do with the reason there are two Koreas in the world. I’m not sure. But that’s basically all I knew! Shocking you might think? Well in South Africa we did not cover the Korean war. Our History books obviously covered Apartheid rigorously. I can remember Napoleon, both World Wars and the Cold War was briefly touched. Also the amount of Hollywood movies glamorizing the Vietnam war kind of shoved the horridness of the Korean War behind the curtain. Since I’ve been in Korea I’ve came across a few people that lived through the War. If their English allows it they share their stories with earnest. This country have experienced pain and suffering! In my quest for a deeper understanding of the War I have done some research this past week. I read up on the War before going to the DMZ but only briefly. Only now do I feel I have a clear understanding of the Korean War. I thought it good to blog about the War as it comprises such a great part of Korean culture! So here goes, this is my summary of the War that divided one people at the 38th parallel. The whole Korean peninsula (North and South) was ruled by the Japanese from 1910 to 1945. When Japan was defeated in World War 2 the allied forces claimed Korea. Korea is to some extent Asia’s Germany (apart from the fact that they had nothing to do with World War 2). So just like Germany, Korea had to be divided between the Capitalists and the Communists effectively creating Socialist North Korea and Capitalist South Korea. An invisible ‘Berlin Wall’ was created at the 38th parallel roughly dividing the Korea peninsula in half. It goes without saying that there were tensions between the newly created North and South. On 25 June 1950, 6 years after the end of Japanese rule, North Korea crossed the 38th parallel invading South Korea starting the Korean war! The full fledged war was between the Republic of Korea (South) and the Democratic Peoples Republic of Korea (North). South Korea was supported by the United Nations and mainly the United States. The North was obviously supported by China and the Soviet Union. 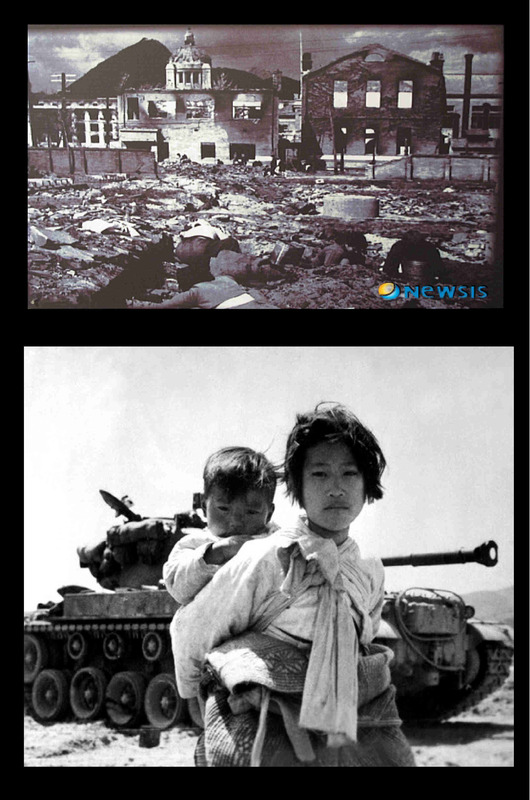 The Korean war was thus the first armed conflict of the Cold War. The was went on for three years and destroyed everything in Korea (both North and South). 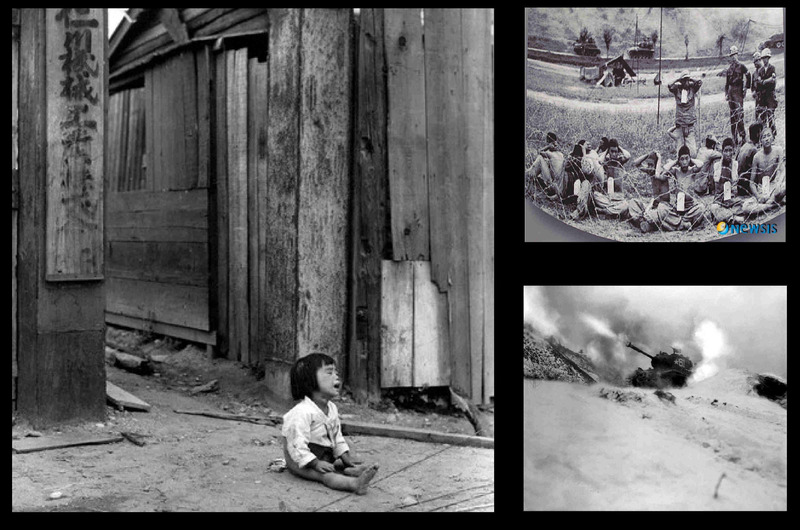 It is estimated that 3 million people died during the Korean war. The united Nations forced peace talks with all involved parties. And eventually on 27 July 1953 and Armistice agreement has been reached. An armistice is and an agreement to stop fighting, but not necessarily to stop war. North Korea, China and the UN signed the Armistice but South Korea refused. Thus the two Koreas are still technically at war. Also after nuclear tests by north Korea in 2009 Pyongyang announced that they are no longer bound to the pact of the 1953 Armistice. The 1953 Armistice resulted in the creation the Demilitarized Zone on the 38th parallel. The DMZ is a 4km wide buffer zone between North and South and stretches from east to west. Both sides of of the DMZ (North/South border) is the heaviest militarized area in the world. After the War South Korea implemented heavy industrialization policies and became one of the leading Asian economies. North Korea on the other hand with its rigid socialist system is still impoverished and under developed. Here are some great but horrifying pictures i found on the internet of the Korean War! 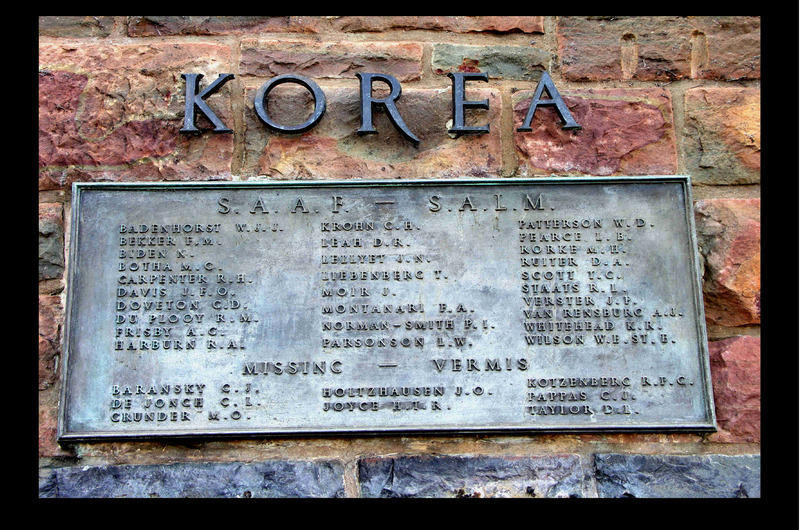 “South Africa’s contribution to the Korean War. The South Air Force sent its famous 2 squadron. The 2 Squadron has been involved in every combat that the SAAF participated in (http://en.wikipedia.org/wiki/2_Squadron_SAAF). This is a plaque at the Union Buildings in Pretoria to commemorate those south Africans who lost their lives during the War. 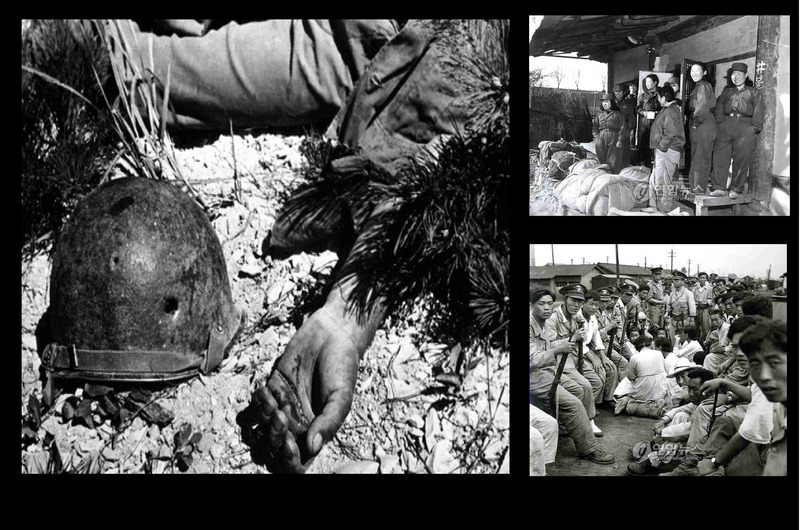 The Korean war was devastating and it’s effects are still present today! ← World Cup’ing in Kimchiland! OMG I’m working on a post on the exact same thing! Great minds think alike! I was also embarrased by my lack of knowledge on the topic and the US was heavily involved! I’m still in the process of conducting my research but I’ll let you know when it’s finished. Great post! If you get a chance, definitely read “The Korean War” by Max Hastings. 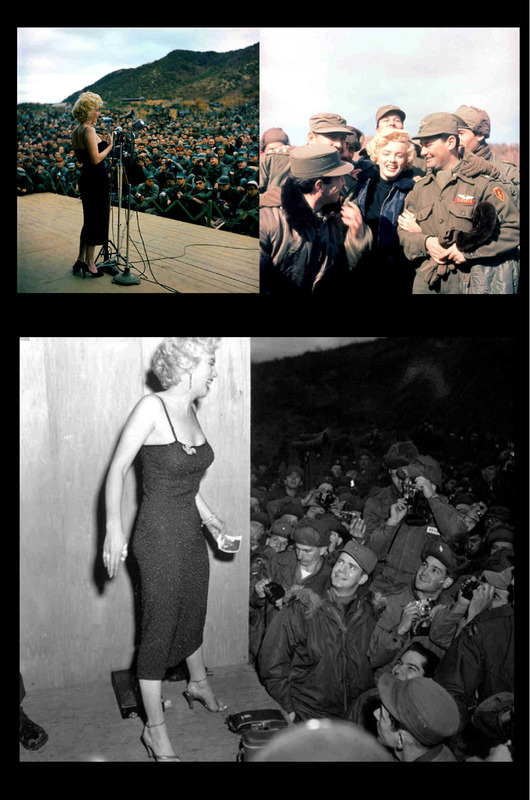 A really riveting read on the follies and tragedy of the war. Max Hastings is one of my favourite authors when it comes to war histories. You should be able to order a copy through Whatthebook here: http://www.whatthebook.com/book/9780671668341?